Detection of Mouse PD-1 by Western Blot. Western blot shows lysates of 293T human embryonic kidney cell line mock transfected or transfected with mouse PD-1. 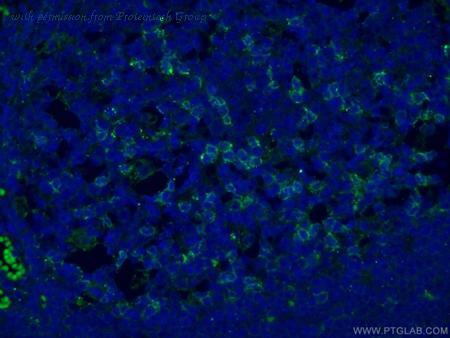 PVDF membrane was probed with 0.2 ╡g/mL of Goat Anti-Mouse PD-1 Antigen Affinity-purified Polyclonal Antibody (Catalog # AF1021) followed by HRP-conjugated Anti-Goat IgG Secondary Antibody (Catalog # HAF017 ). A specific band was detected for PD-1 at approximately 75 kDa (as indicated). This experiment was conducted under reducing conditions and using Immunoblot Buffer Group 1 . Detection of PD-1 in Mouse Splenocytes by Flow Cytometry. 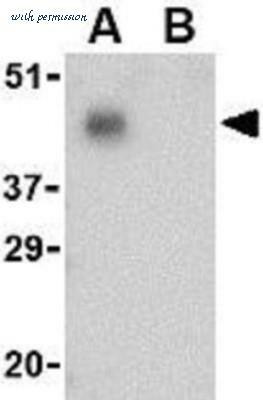 Mouse splenocytes either (A) resting or (B) treated with 5 ╡g/mL of PHA for 72 hours were stained with Rat Anti-Mouse PD-1 Alexa Fluor« 488-conjugated Monoclonal Antibody (Catalog # FAB7738G, filled histogram) or isotype control antibody (Catalog # IC006G, open histogram). View our protocol for Staining Membrane-associated Proteins . Detection of PD-1 in Mouse Splenocytes by Flow Cytometry. 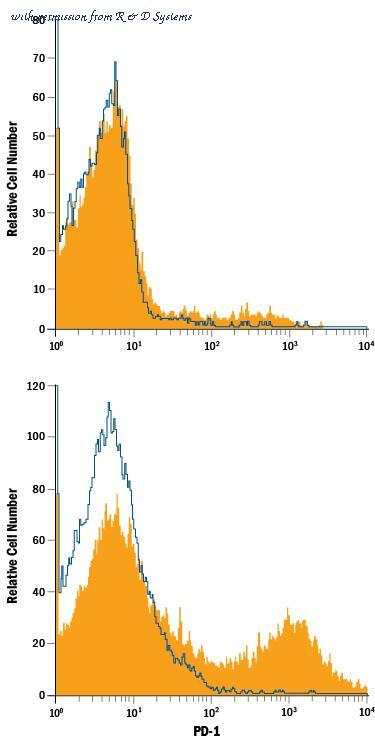 Mouse splenocytes treated with 5 ╡g/mL PHA for 72 hours were stained with Rat Anti-Mouse PD-1 PE-conjugated Monoclonal Antibody (Catalog # FAB7738P, filled histogram) or isotype control antibody (Catalog # IC006P, open histogram). View our protocol for Staining Membrane-associated Proteins . 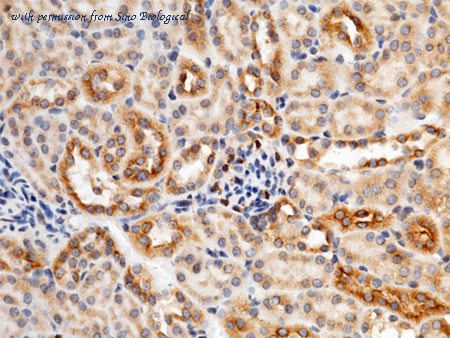 The PD-1/CD279 antibody from Proteintech is a rabbit polyclonal antibody to a fusion protein of human PD-1/CD279. This antibody recognizes human, mouse antigen. 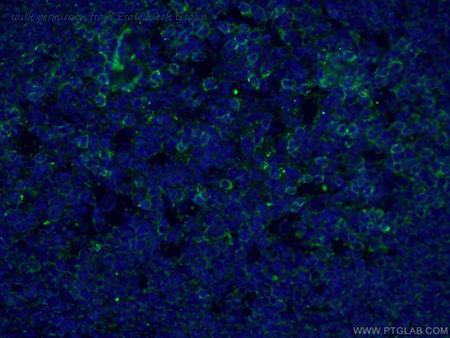 The PD-1/CD279 antibody has been validated for the following applications: ELISA, WB, FC, IHC, IF analysis. 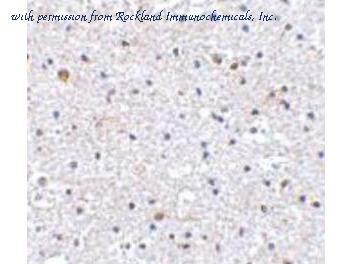 The PD-1/CD279 antibody from Proteintech is a mouse monoclonal antibody to a recombinant protein of human PD-1/CD279. This antibody recognizes human, rat, mouse antigen. The PD-1/CD279 antibody has been validated for the following applications: ELISA, WB, IHC, IF analysis. Immunochemical staining of mouse PDCD1 in mouse kidney with rabbit polyclonal antibody (1 µg/mL, formalin-fixed paraffin embedded sections). Positive staining was localized to nephric tubule. Western Blot: PD-1 Antibody [NBP1-77276] - THP-1 cell lysate with PD-1 antibody at 1 ug/mL in the (A) absence and (B) presence of blocking peptide. 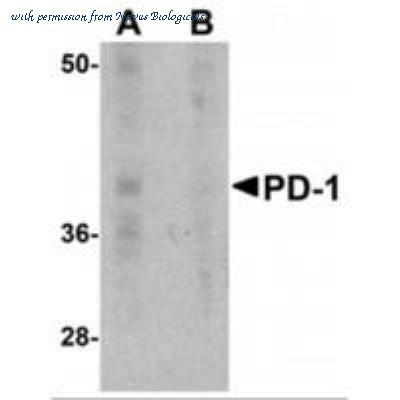 Western Blot: PD-1 Antibody (7A11B1) [NBP1-75518] - A-20 cell lysate with PD-1 antibody at 1 ug/mL in the (A) absence and (B) presence of blocking recombinant protein. 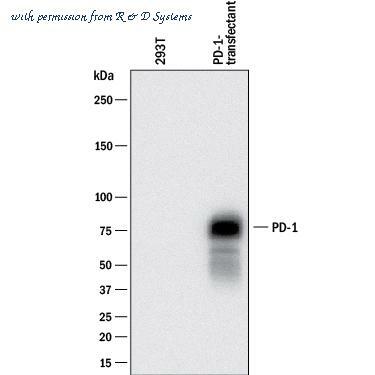 Western blot using Rockland's affinity purified anti-PDCD1 antibody shows detection of a predominant band at ~47 kDa corresponding to PDCD1 (arrowhead) in THP-1 whole cell lysate. The predicted MW of PDCD1 is 32 kDa. PDCD1 was probed in the absence (lane A) and presence (lane B) of blocking peptide. 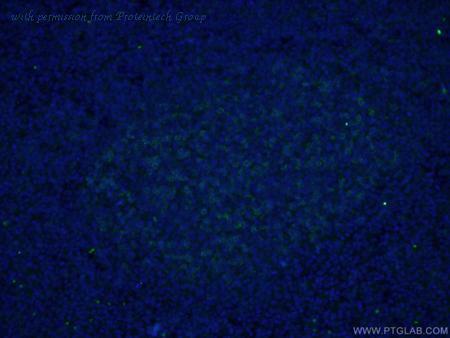 orb19032 (0.6ug/ml) staining of Human Bone Marrow lysate (35ug protein in RIPA buffer). Primary incubation was 1 hour. Detected by chemiluminescence.